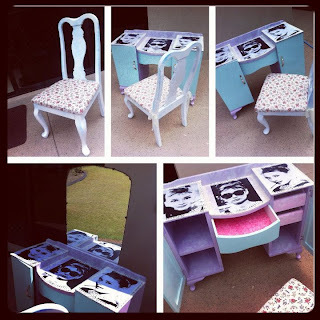 On Saturday Alex and I headed down to Oxenford to pick up my delightful one of a kind Audrey Hepburn dressing table from Kat Creasy of My Little Rockabilly. The dressing table has a soft colour pallete inspired by a children's nursery, similarly to many of my other furniture pieces. My attire for the day consisted of similar colours and clashing lace pieces.